Comodo Antivirus is a free antivirus solution that reliably protects your computer against viruses, malware, worms, Trojans, hackers and many other online and offline threats. It ensures protection even against unknown threats through the auto-sandboxing feature which completely isolates suspicious files in a virtual environment. 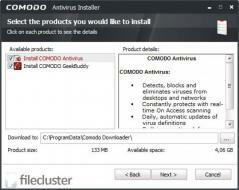 Comodo Antivirus offers all the essential tools needed to keep your computer protected at all times. This includes multiple scan modes, in-depth reports, detection of suspicious files with virus-like behavior and many others. To keep up with the latest threats, Comodo Antivirus offers its users an easy way of submitting suspicious files to the Comodo Safe List. - Optimized for low resource consumption, it operates without impairing your system’s performance. - Even hidden, suspicious file are detected. - 100% safe and free to use.